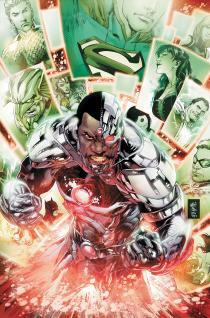 Justice League #18 begins a story arc centering on Cyborg, with interesting parallels to some pre-Flashpoint tales. But, rather than Batman having files on all the heroes in the DCU, it is now Cyborg who has been tracking and filing info on every hero operating in the New52. While this is most useful in sending invitations to potential League members, there is always some danger in keeping those kinds of files…and that obviously will lead us into the next few issues of JL. The moments of most interest to Flash fans, however, concern Wal…I mean Barry’s interactions with the other League members and with the potential members invited to the Watchtower. The Flash we see in this issue appears much more outgoing, quicker with a joke, and more fun-loving than the Barry we know in the New52. This could well be one interpretation of how Barry would interact in a crowd, particularly with a lot of unfamilar folks around…but his actions seemed to be much more Wally-like than New52 Barry…certainly not Barry’s peronality either before or after Flashpoint. It seems odd to mention this, especially since Geoff Johns is writing. But, Barry’s portrayal in Justice League has seemed a bit off throughout the New52 run, even though I am a big fan of the series. We missed seeing The Flash entirely during the last story arc, due to his fight with Grodd. Now, when we get Barry back, it doesn’t really sound like Barry at all – certainly not the Barry Allen presently portrayed by Manapul and Buccellato, and not even the pre-Flashpoint Barry handled by Johns. It really seemed like we were getting Wally back, just with Barry’s name. In the end, this is a good issue of Justice League overall. The idea of “tryouts” was handled well, and their choices for members were interesting. It was great getting to see one of the Metal Men in the New52, and the new Atom was a surprise…you’ll have to read the issue to see what I mean. The back-up story continuing the story of the New52 Shazam was excellent. My only complaint is one that I’ve had several times with this otherwise excellent series…how The Flash is portrayed in the Justice League. I would be extremely glad to see Wally West show up in the New52, and on that point there are a lot of fans who would agree. But, having Barry act like Wally isn’t the answer. SUMMARY: Justice League #18 is a good issue, setting up a very interesting Cybord-centered arc, and it is worth the read. However, if you expect the Flash to act like Barry, you may be surprised. This entry was posted in Reviews and tagged Barry Allen, cyborg, Justice League, Wally West on March 25, 2013 by Ed Garrett. Oh thank god it wasn’t just me. I saw the preview scans with Flash being propositioned by Golddigger…I mean Goldrush…and it was cute and….damn if it didn’t look exactly like Wally feeling surprised and harassed what with the suit belt and his expressions. The scene was cute, but at the same time didn’t endear me to the book for the very reason you stated. It was pretty strange how he played stand-up comedian throughout the issue! Although now I think about it, much of that might be due to Hal Jordan’s absence – Barry usually played the straight man countering Hal’s reckless shenanigans.